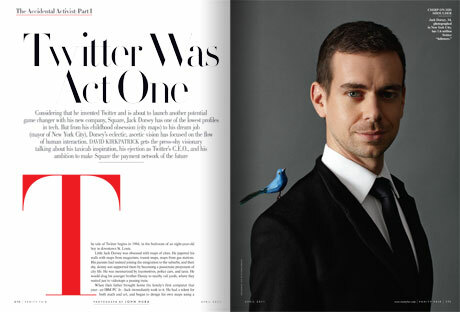 Jack Dorsey On Being Ejected From Twitter: "It Was Like Being Punched In The Stomach"
Jack Dorsey gets the Vanity Fair treatment in a long profile written by David Kirkpatrick (author of The Facebook Effect). It goes over familiar ground for anyone who’s been following Dorsey—his obsession with maps and cities, the founding of Twitter, his ouster, and more recently new company Square (which is doing just fine, thank you). But Kirkpatrick pulls it all together into a cohesive narrative peppered with some new details. You learn, for instance, that “Dorsey’s personal wealth may well exceed $300 million,” Square now has 78 employees and that one day, he says, he wants to become the Mayor of New York City. But it took him a while to find himself. In addition to being a programmer and entrepreneur, Dorsey also tried his hand at being a botanical illustrator, a certified massage therapist, and even took classes in fashion design to try to learn to design jeans (he only got as far as skirts, though, before Twitter took off). Looking back, Dorsey admits he was a flawed manager: “I let myself be in a weird position because it always felt like Ev’s company. He funded it. He was the chairman. And I was this new guy who was a programmer, who had a good idea. I would not be strong in my convictions, basically, because he was the older, wiser one.” Dorsey did a poor job explaining where he wanted the company to go. “It just got a lot bigger a lot faster than anyone expected,” says Williams. “A year and a half later we’d raised $20 million, and the servers were crashing every day. It wasn’t so much that the ship was sinking, but more ‘Great job, Jack—we’ve got to up our level of experience and lay some foundation for a much bigger organization.’ ” Others say the two were barely speaking by then, and in October 2008, Williams took the C.E.O. job for himself. Dorsey became chairman, but was no longer an employee. “Payment is another form of communication,” he says, “but it’s never been treated as such. It’s never been designed. It’s never felt magical. About 90 percent of Americans carry cards, but almost nobody can accept them. We want to balance that out and just make payments feel amazing.” Dorsey talks about how Square must be “pixel-perfect,” and staffers tell stories about him agonizing over the exact location and thickness of a line on e-mailed receipts. Maybe becoming Mayor of New York City will have to wait. In the meantime, he has a suggestion for the New York Taxi and Limousine Commission: Rip out the blaring video screens in the back of taxis and replace them with iPads (and Square credit-card swipers).